Appropriately known as “The Bird’s Head Peninsula”, due to its uncanny resemblance to a large bird, Indonesia’s West Papua province is home to one of the world’s more unique cruising destinations: “Raja Ampat”. In the 15th century, this area was a part of the Sultanate of Tidore, one of the major powers of the Spice Trade, and a very powerful ruler of the time. In order to solidify his rule in the Papua area, the Sultan bestowed titles on the rulers of the four largest islands (Waigeo, Batanta, Salawati, and Misool) to govern the area in his stead, hence the name Raja Ampat or as it translates into English “The Four Kings”. These four large islands make up the vast majority of the landmass in the area and are surrounded by hundreds of small islands, islets, and atolls covered in rich vegetation sprinkled throughout beautiful blue water. Limestone and karst islets, covered with healthy green jungle, create a landscape of spectacular “rock islands” that dominate the region. 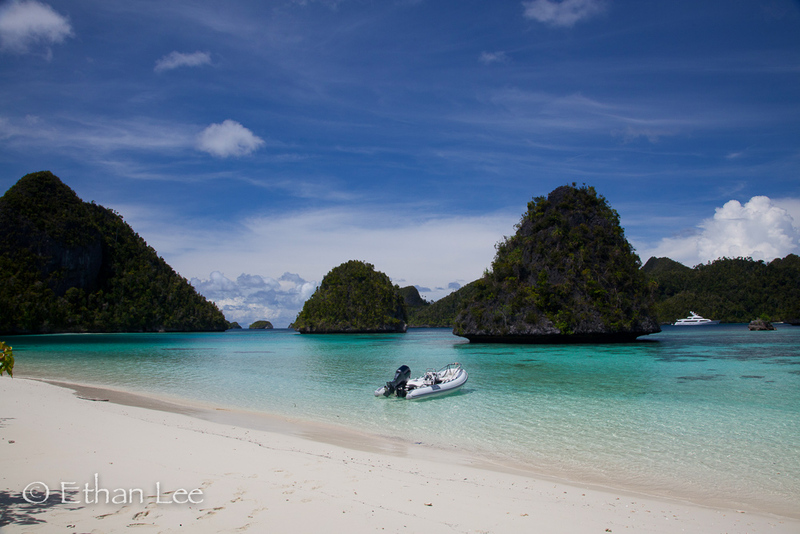 With over 40,000 km2 of ocean and islands, Raja Ampat boasts over 1,500 islands, islets, and shoals and unlimited exploration opportunities. The sheer variety of eco-systems in the area can keep curious travellers entertained for weeks on end: blue water mangroves, marine lakes, primordial forest, white sand beaches, and deep fjords are a few samples of what awaits. However, it’s the marine life that makes Raja Ampat standout. Located at the heart of the “Coral Triangle”, the aquamarine waters thrive with 75% of the world’s known coral species and the largest diversity of marine fish life to be found anywhere on the planet. In 2007, 10 areas in the region were declared marine protected areas and the amount of protected water has since grown to encompass over 12,000 square kilometres of reef. In 2010, the Raja Ampat Regency declared a shark sanctuary and it’s now prohibited to kill sharks, rays, dugongs, and turtles everywhere in Raja Ampat. As Raja Ampat is spread over a large area and features such a variety of habitats, it can be difficult to decide what activities to explore! Here are ten of the top adventures that can be enjoyed by everyone visiting the region. In the far north of the Raja Ampat archipelago, the two remote and sparsely populated island groups of Piai and Sayang are nesting grounds for endangered green turtles (Cheloniamydas). From May to September, hundreds of these female reptiles struggle to pull themselves onto the beach each night in order to give birth to the next generation. 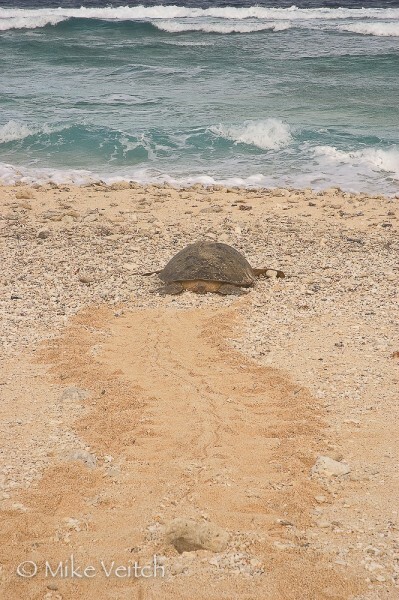 Until the not too distant past, local people from nearby Ayuatoll collected the eggs and killed the female turtles to provide a protein source other than fish. Obviously, this was proving disastrous to the turtle population as numbers were declining sharply. Seeing the decline in numbers, several conservation groups worked with the villagers to educate them about the plight of turtles and ways of sustaining their survival. The villagers were happy to co-operate with the environmentalists due to grass roots education and agreed to stop harvesting the nesting turtles. In order to replace the protein in their diet, funds and training were provided to establish pig farming on the islands as a viable alternative for the villagers. Now the local people, with co-operation from conservation agencies, have created their own Turtle Protection project (The Papua Sea Turtle Foundation) and maintain several turtle monitoring stations in the islands. They eagerly accept visitors from yachts who would like to experience watching nature at its primeval best. The opportunity to go ashore during the evening and wait for a 500 pound green turtle to haul itself out of the water is an experience not to be missed! Sitting quietly on the sand watching a large female turtle struggling in the continuation of her species truly is a life altering event.Note: It’s important to report the presence of any visitors to the local volunteers at Piau Island and to work with them to ensure safe turtle interactions for both humans and turtles. Small gifts, such as food and drinks, are readily appreciated by the “rangers” on these lonely outposts far from any proper villages or stores. 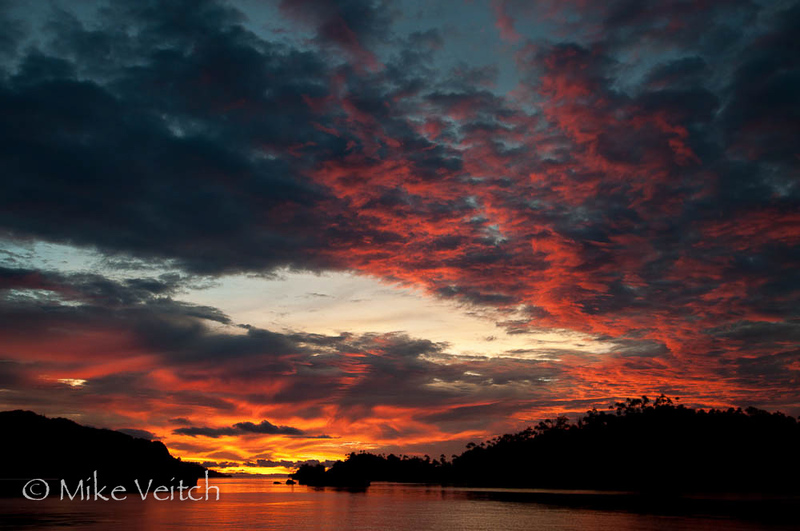 Located to the northwest of Waigeo is the stunning island of Wayag. Littered with small mushroom shaped islets, innumerable lagoons, and shallow coral reefs, this island group is a picture perfect environment to explore for a few days. The western edge of the islands boasts a safe anchorage in one of the most stunning lagoons anywhere! Surrounded by green vegetation and deep blue water, the karst and limestone rocks have been eroded over thousands of years into an incredible display of nature. One of the highlights of a visit to Wayag is to embark on the short hike to the summit of Mt. Pindito enjoy the panoramic view of the vista overlooking the bay. On the eastern edge of Wayag, an inland marine lake lies just inshore from the beach and is easily accessed. Intrepid snorkelers can swim in the lake to encounter stingless jellyfish, endemic fish, and other brackish water dwellers, a truly unique adventure. On the western edge of Waigeo Island lies a calm and protected fjord named Aljui Bay. Home to the Cendana Pearl Farming operation, this large bay is surrounded by forested hills and is one of the most peaceful areas in Raja Ampat. When visiting Aljui Bay, it’s important to check in with the pearl farm upon arrival in order to discuss what activities are available and if any special measures must be followed. 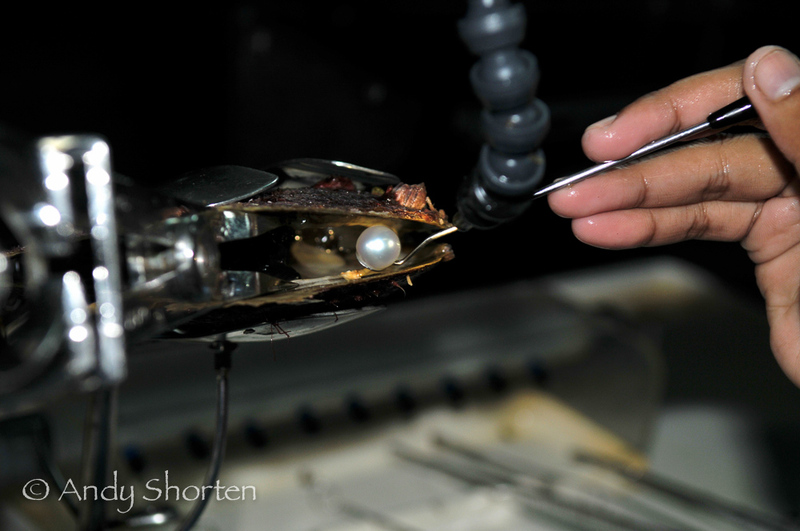 Tours of the pearling operation are available and beautiful pearl jewellery can be purchased on site. With a guide from the pearl farm, it’s possible to cruise through the fjord to discover a wealth of wildlife including cockatoo, parrots, hornbills, dolphins, and if lucky, the legendary salt water crocodile. Another highlight of Aljui is the opportunity to see ancient cave paintings from the original settlers on the steep cliffs deep in the bay. The dock of the pearl farm offers one of the finest night dives in the entire archipelago. 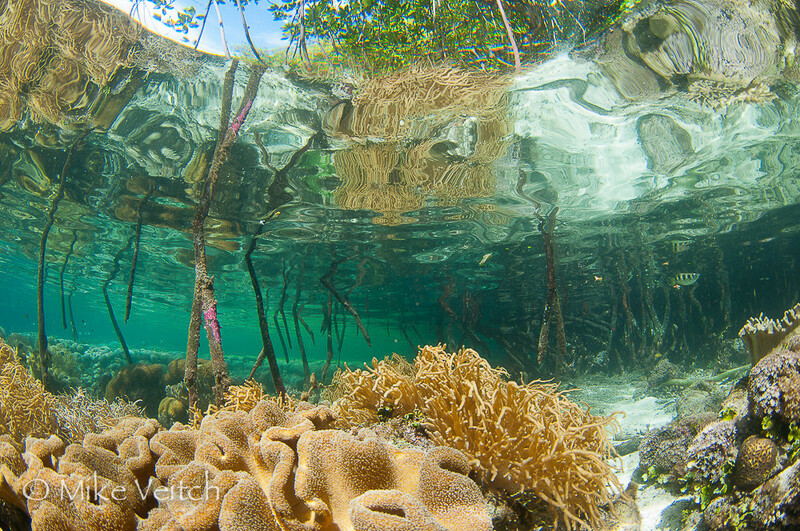 Raja Ampat is home to some of the most stunning mangrove habitat in the world. What sets the mangroves of the area apart from elsewhere is the fact they are surrounded by clear water as opposed to inshore brackish water found in most mangrove habitats. On the western edge of Gam Island lies a crescent shaped channel separating Gam from the small island of Yangeffo. The sides of this channel are ringed by clear, shallow reefs and blue water mangroves that offer amazing exploration opportunities. Snorkelers can safely swim in the shallows to inspect delicate hard coral, myriad juvenile fish, the bizarre Archer fish, schools of tiny needle fish, and brightly coloured soft corals growing on the roots of the mangrove trees. Further to the north-east, Gam is separated from Waigeo by the fast flowing Kabui Pass. One of the highlights in the area is the opportunity to experience high voltage “drift snorkelling” through this narrow passage. Swarms of small fish, bright corals, and the occasional ray or large grouper gather in the channel as water rushes through during rising or falling tide. This adventure definitely is not for the faint of heart! The water speeds through at a fast pace and swimmers drift with the current past mysterious roots of mangrove trees with the call of tropical birds echoing in the distance. Participants must be confident swimmers to avoid a few coral heads and roots that pop up along the way.Note: It’s important in both Kabui Pass, as well as Yangeffo, to time snorkelling activities considering tidal movements in order to ensure clear water and good visibility. One of the iconic dive sites in Raja Ampat “Manta Sandy”, is famous due to a consistent population of Manta Rays during the months of November through May. These gentle giants can be found feeding at the surface or hovering over a cleaning station at 40 feet of depth (13 metres) and are not scared off by respectful snorkelers and divers. 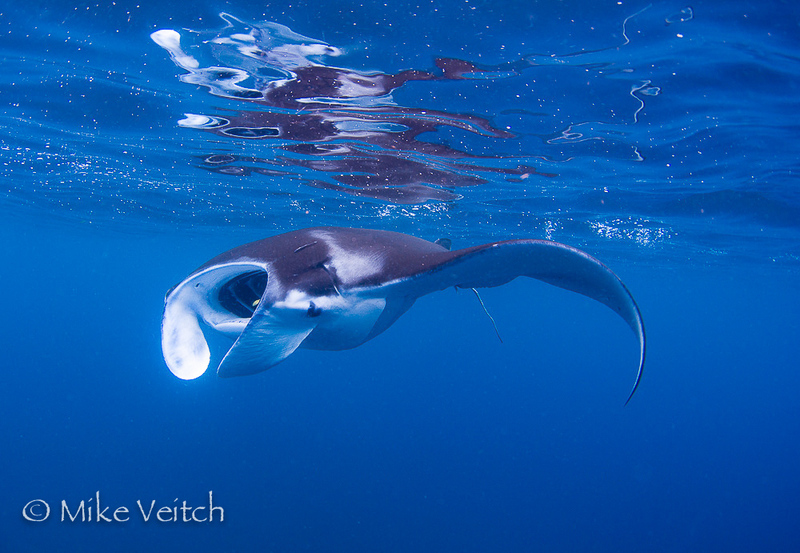 Typically, three or four of these large rays can be found, but often groups of more than ten cruise the shallows while feeding. There is no feeling on earth quite like the sense of wonder and awe a person feels when coming to face to face with these large rays.This site is one of the more popular diving areas in the region and is quite popular with dive boats. In fact, it’s not uncommon to find two or three diving liveaboards as well as several boats from resort operators at the site at the same time. Communication with other boats is key to avoiding too many people in the water at the same time and ensuring safe encounters for divers, snorkelers, and mantas alike. Currents can be strong and there are many shallow sand banks throughout the area, caution is needed when approaching. 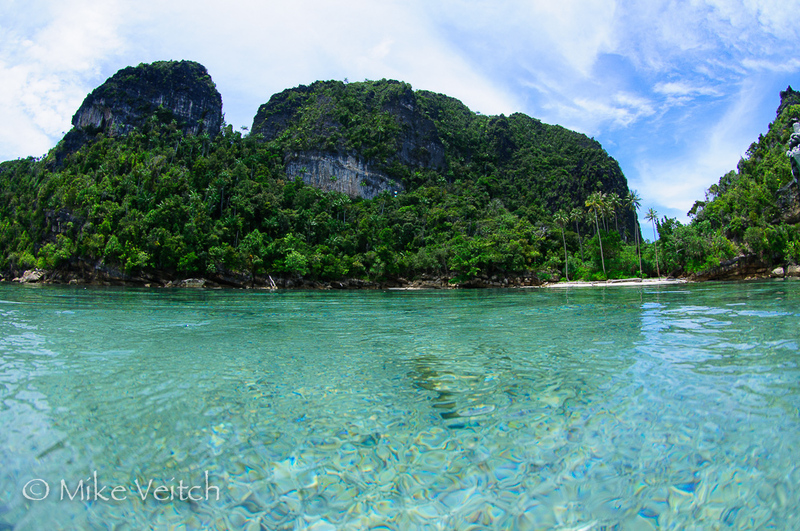 The island chain of Fam and Penemu is home to some of the most visceral vistas in all of Raja Ampat. After snorkelling or diving the pristine hard coral reefs that ring the islands, a perfect ending to the day is to experience a sunset cocktail cruise via tender boat through the winding channels covered in emerald green foliage nestled within tranquil lagoons. Not to be missed is a trek to the caves of Tomolol on the east coast of Misool Island. The cave system is located in a beautiful setting within a sheltered lagoon surrounded by rich green fauna and shallow blue water. Dotted along the limestone rock faces are hundreds of “Pitcher Plants”, carnivorous plants related to the Venus Flytrap, as well as a plethora of orchids and other unique plant life. The cave system is a collection of water filled caverns located in a depression in the limestone that is well marked and easily accessible. Millions of years of seawater have carved out the stunning entrance to the cave and the lagoon water continues to meander through the main chamber carving the limestone into beautiful shapes. 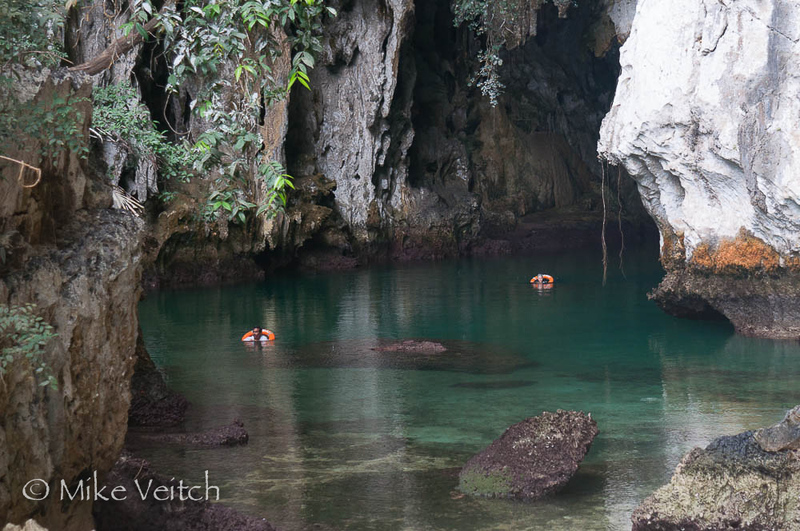 The best way to explore the caves is with a float device such as a tube, life jacket or life ring along with a mask, fins and a water-proof light. The main cavern is accessible even to those with claustrophobic tendencies as the entrance to the cavern is large enough to fit a bus and there is plenty of natural light throughout. However, the water is dark inside the cave and can feel quite eerie as the bottom slopes away. There are several side tunnels that can be reached with a short underwater swim or if the tide is low then these openings are exposed. Stalactite formations in the main chamber as well as the side caves are spectacular and well worth photographing.Not too far from the cave system are a series of “cave paintings” high up on an exposed wall of limestone. The red drawings illustrate several readily recognizable animals such as birds and fish as well as outlines of human hands in a form that conveys thoughts of “ancient graffiti”. These cave paintings are estimated to be between three to five thousand years old and similar paintings can be found throughout West Papua.Note: The cave system is located close to a large pearl farm that takes security very seriously. It’s imperative for all visitors to first check in with the pearl farm before continuing on as boats need to pass through the farm to gain access to the caves. As the local Muslim village considers the caves and the nearby burial spots as sacred areas, it’s mandatory to visit the village to ask permission to visit and organize a compulsory village guide. Nestled within the multitude of islands in the Balbulol group, to the east of Misool, is one of the most picturesque areas of Raja Ampat. 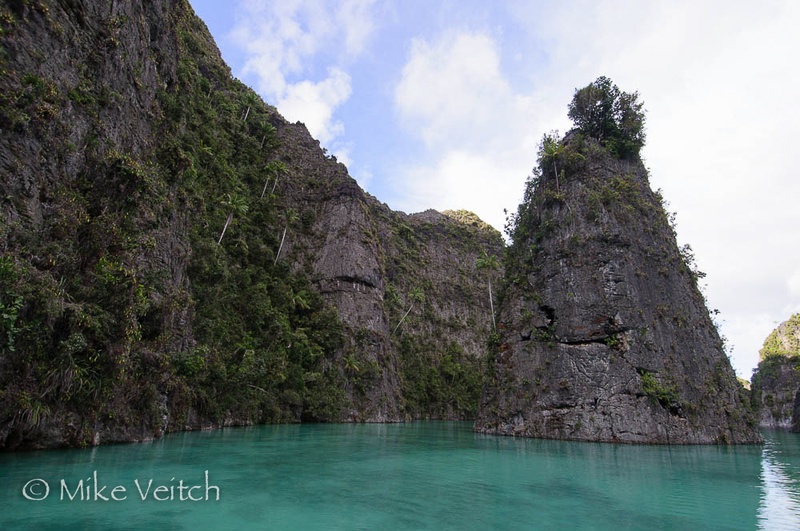 Giant “beehive” shaped karst rocks tower out of picture perfect shallow lagoons. Inside this series of inlets and passages, the water glows with multi-coloured hues created by a mix of reef and sandy bottom composition to create a perfect contrast with the surrounding rocks. The ideal way to explore these waterways is by kayak or paddle board in order to get close to the undercut limestone walls which teem with “pitcher plants” and wild orchids. The ideal time of day to explore the area is at dawn or the late afternoon when the sun is not too hot and the sky is a deep rich blue. Located approximately 150 nautical miles to the south east of Misool, on the mainland of West Papua, is a spectacular waterfall falling directly into the sea. The Momon waterfall stems from a relatively large river that originates in the highlands of the Papuan jungle and terminates in a glorious fashion amongst beautiful primordial jungle. Easily spotted from miles offshore, the falls can be approached by skiff and adventurous guests can jump into the ocean and swim directly to the waterfall. The water pouring over the edge creates a wide screen of fast flowing fresh water. Tucked in behind the waterfall is a small protected rock ledge; swimmers can enter this cavern and take photographs through the curtain of water for a unique view of the world. 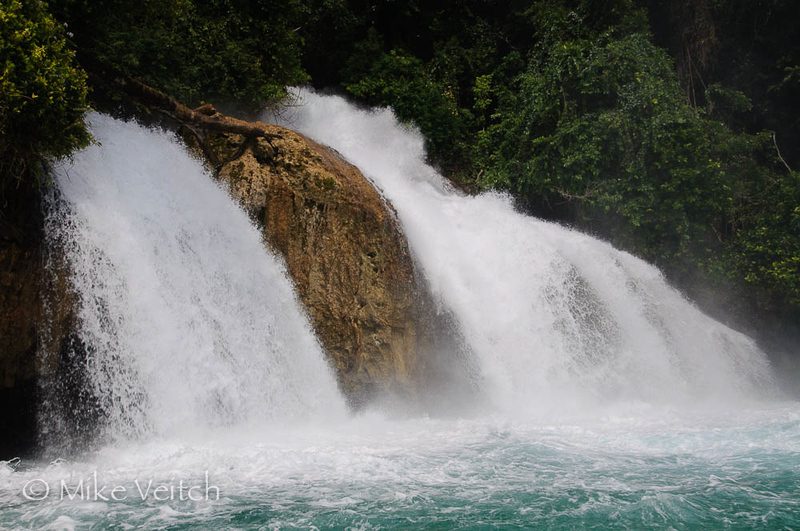 The experience of swimming out from behind the waterfall is akin to swimming down a white water river. A word of warning, the river water is much cooler than the ocean! 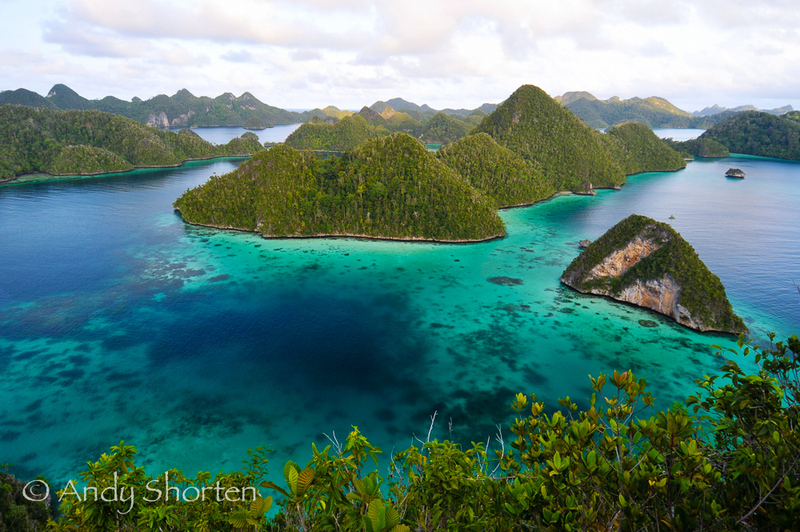 With over 1000 species of fish and the largest variety of coral on the planet, Raja Ampat truly is a divers’ Mecca. From north to south and east to west, the entire Raja Ampat archipelago offers stunning and unique dive sites suitable for beginners and experts alike. The north is known for large schools of fish, brilliant orange soft corals, underwater caverns, and encounters with manta rays. The south-west portion of Batanta is home to numerous “muck diving” sites where wonderpus, blue ring octopus, cuttlefish, and nudibranchs of all shapes and colours can be found. 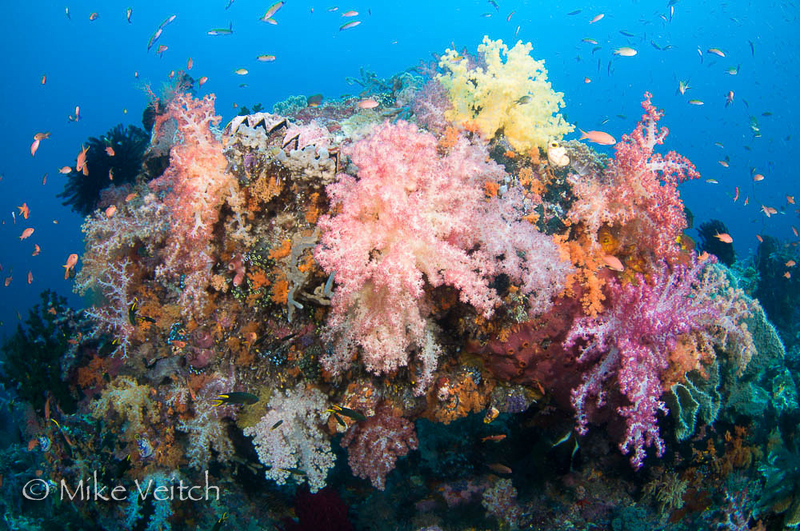 In the south, especially in the Misool area, countless walls covered with multi-coloured soft corals abound. Nestled within many of the sea fans can be found three different species of the much sought after pygmy seahorse. Wave upon wave of fusiliers, damselfish, and chromis pulsate along the reef slopes while sharks, grouper, trevally, and rays navigate the blue. As a diving destination, Raja Ampat offers a variety of topography and marine life unparalleled in the world. The large geographical size and sheer variety of attractions throughout Raja Ampat are what makes it a world class cruising destination. Every new island that appears on the horizon offers endless opportunities to explore undiscovered coves and secluded beaches, each more spectacular than the last. 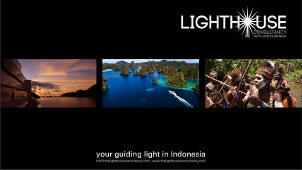 With proper planning and the right logistical team in place, Raja Ampat offers an unparalleled mix of cultural and natural attractions found only in this unique part of the world. Whether it be a short one week trip or several months of cruising and exploration, Raja Ampat offers a variety of itineraries suitable to any and all schedules.